You will notice there are some missing arguments from my code, I just don’t use all of the arguments available to me when opening a form, (for example: the filter argument). Juan Soto is a Senior Access Developer at IT Impact Inc. and a Microsoft Access MVP. 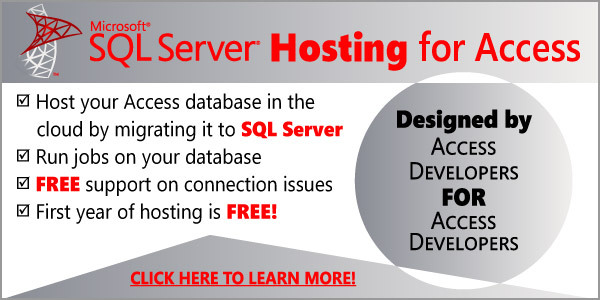 He specializes in Access with SQL Server databases. His passion for Access has led him to helping a wide range of businesses in helping them establish a secure, stable and efficient environment with SQL Server. He's a frequent speaker at Access user groups nationwide and recently spoke at the Orange County SQL Saturday # 73. If you wish to have Juan speak at your next group meeting you can contact him here. Access HelpDesk: enjoy all the wonderful advantages of our world class Access team at a great value! Access Report Generator: see the power of our technology. $199.99 or free with any project you order! Powered by Great Custom Websites • We are a Microsoft Access Development Company with Headquarters in Chicago, Illinois, USA. We have clients in Miami and Orlando - Florida, Dallas - Texas, Puerto Rico, New York. Large client base in Houston - Texas, San Francisco and Los Angeles - California, Washington, Denver - Colorado.